For those on a budget who want a reliable out-of-the box, no-frills, five- shot .38 Special, they might want to look at the Taurus M85. Unfortunately, the name Taurus has been synonymous with being an unreliable and cheap gun, of the likes of Raven Arms, who makes low quality pistols. Let me clear up this rumor, they make an affordable and reliable self-defense gun. Nothing more and nothing less – simply the best bang for your buck. I won’t fool you; this isn’t the gun to do trigger jobs on or to customize, just a great self-defense weapon. To my knowledge, this is the only gun manufacture that comes with a lifetime warranty on the gun, not the owner. Therefore, if you do buy one used, the company will cover it for repair at no cost to you. Yet another added bonus if you ask me. A little history on the company – Taurus, based in Brazil, has been making guns since 1941 and importing to the US since 1968. In 1970, Bangor Punta Corporation, then owner of Smith and Wesson, purchased a holding share of Taurus. This explains why many of the Taurus revolvers look a lot like Smiths, as many were made on the same tools. 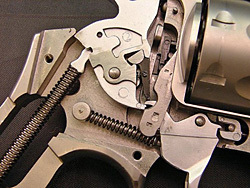 Sadly, few, if any parts are interchangeable – Taurus using coil springs for the main spring, unlike Smith and Wesson. In 1977, Taurus broke out on its own, cutting all ties to Smith and Wesson. By 1984, the company created a subsidiary know to all as Taurus USA, based in Miami, Florida. Two of the guns that became their meat and potatoes were the M85 .38 special and the M66 .357 magnum revolvers. The post-1996 Taurus revolvers and semi-autos models all have key locking features to disable the weapon. On the revolvers, it’s located on the hammer; on the semi-autos, it is located on the upper receiver or slide. Neither of my current Taurus revolvers, the M85 nor the M94 (4” .22LR nine shot) have this feature, being pre-1996 models. It is a feature that I have never been fond of, though I understand that gun companies have to be politically correct in today’s climate. Taurus’s locking feature is, however, voluntary to engage by the owner. All Taurus revolvers do use a transfer bar and have the firing pin located in the frame for safety. Having the firing pin in the frame, to my knowledge, was first introduced Andrew Fyrberg in 1891 and later perfected, I believe, by Ruger in the 1970’s. Other revolvers, such as Colt and Smith, utilize hammer blocks that are effective in their own right. Taurus also makes the Model85 in many other variants, some very similar to those made by Smith and Wesson. 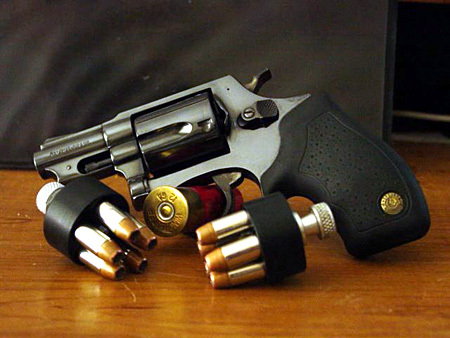 Such as the Model 851, equivalent to the S&W bodyguard and the Model 650 equivalent to Smith’s Centennial. The M85 are made in Ultra-light versions too, for those who wish for something lighter. The M85 can handle +P rated loads, such as 135 grain Gold Dot, my personal preference for carry load. The revolver is also relatively accurate for having a 2” barrel, making four and five-inch groups at 25 feet. In my opinion, this is good enough for my self-defense. After all, it is a snub nose revolver, not a target gun; its role is to defend at close range. I have had two Taurus .38 specials in my life, my current older version and one newer version. I highly recommend any Taurus revolver – their reliability and simplicity can’t be beat for the affordable price. In fact, I’m keeping room in the safe for a M66 .357 from Taurus which will fill three roles for me, as a bedside gun, field gun, and possible used as a hunting gun.